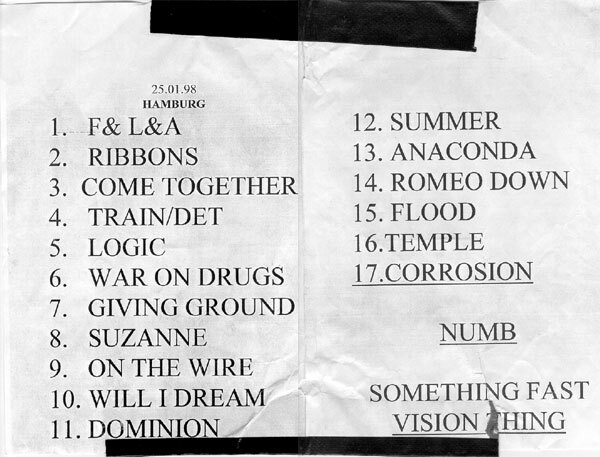 The setlist (most of it, anyway) formed by the 6th gig of it in Herford. There were roughly three variants of the setlist, which differ mostly in encores; they are all outlined in below. 1st set includes Herford, Duesseldorf and Munich gigs. 2nd set includes Hamburg and Brussels. 3rd set includes all remaining USA and UK gigs. For some USA gigs an encore of Jolene and Vision Thing was planned but never played; it was finally performed in the second London show. Many concerts slightly differed from the "standard" sets. Most notably, later shows tended to skip Train/Detonation Boulevard and War on Drugs. An average show had 19-20 songs in it, six of them unreleased, two more only available on deleted 80s singles -- all in all, only half songs were familiar to audience without Sisters bootlegs education. Most of these were concentrated in second half of the gig -- more reserved audiences only started showing signs of life during Dominion/Mother Russia and continued it from there. Several songs are not mentioned in the set above. These are Kiss the Carpet (performed 3 times), Body Electric (3), Alice (1), Under the Gun (1) and Sister Ray (1). Kiss the Carpet opened shows three times, moving First and Last and Always to encores where it replaced Something Fast. Two last performances were doubles in the same city -- its inclusion slightly variated second performances. Under the Gun was stopped being played in the middle of the previous Distance Over Time tour. It was performed early in this tour, probably to test if it still fits in the setlist. Apparently, it didn't, and thus abandoned Sisters gigs forever. The three Body Electrics were performed in late tour gigs (all these had Train/Detonation Boulevard excluded), Alice was a one-off to spice the second San Francisco show, and Sister Ray was used as a thank-you to great audience in Brussels. 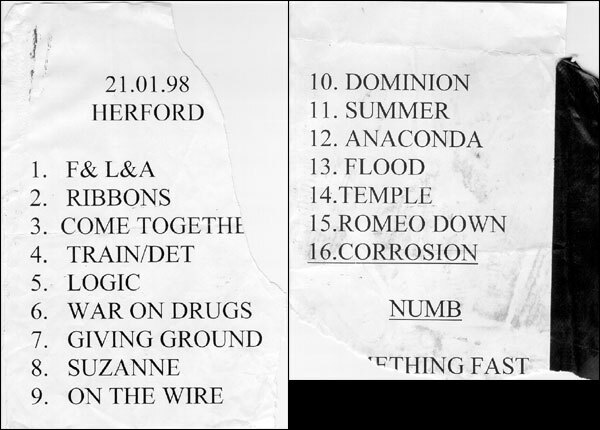 Compared to the previous Distance Over Time tour (1997), three songs were missing -- Burn, Blood Money, and Confide in Me, all three taken off the setlist midway through the tour. 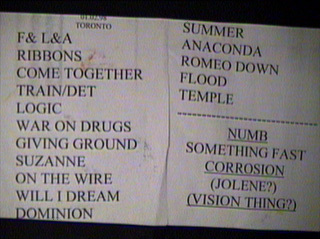 They were replaced by three new songs: Romeo Down, (We are the Same) Suzanne and Will I Dream? Slowish and gloomy song perfectly fits its lyrics. Was touted as "an instant classic"; it certainly is. Glasperlenspiel has analysis of song's lyrics in its site, complete with Eldritch quotes on it. While we're on it, the peanuts you have to pay for both issues of the print zine (you have to only cover the postage) are well worth it; check out the details in the GPS site. If you speak German, you should consider purchasing Head and Star -- it's also cheap, and it's also good. This is the only song in The Sisters of Mercy shows to feature live bass (played by Adam). In early 2000 Andrew Eldritch indicated this song as the best one of all currently available. Many fans agree. Mike Varjak proved he's a worthy addition to the team. The song has a dreamy atmosphere to it, and the verse reminds the hypnotizing ending of Heartland. Guitar work on this one is unusual and great. Note: the vocal switches between English and German pronunciations of the name Suzanne, which is a deft - and mellifluous - twist in a song about "sameness". Draw your own conclusions. The ditty was renamed to "We are the Same, Susanne" sometime between its premiere and To the Planet Edge tour in 1999. The closest Sisters ever got to straightforward dumb rock'n'roll. Fast, simple, and with all admiration potential of a bug buzzing around your head. This song was first played in Munich, after the first third of the tour had already passed. 1998/01/26 Brussels had 22 songs -- that's more than any other show in 1996-2000 period. It also includes the mammoth Sister Ray, the second since its revamp in 1997's Rendsburg gig and only one this tour. Missing are Kiss the Carpet, Body Electric, Alice and Under the Gun -- all played very rarely. If you find this gig on tape/cd/video, you have a definite taste of what the tour looked like. The four gigs preceding this (Herford, Duesseldorf, Munich and Hamburg; they are classified as "1st set" and "2nd set" at the top of this page) have very similar setlists; only Sister Ray and (in the first two) Will I Dream? are missing. 1998/02/06 San Francisco opened with Kiss the Carpet (with First and Last and Always exiled to encores), and has one of few Body Electric performances and one-off Alice; also, it has the only USA performance of Vision Thing. It misses Something Fast (excluded from all gigs with Kiss the Carpet), Train/Detonation Boulevard (excluded from all gigs with Body Electric) and Temple of Love. The second London show is very similar to this one -- some songs changed places, and absence of Alice is compensated by Jolene. 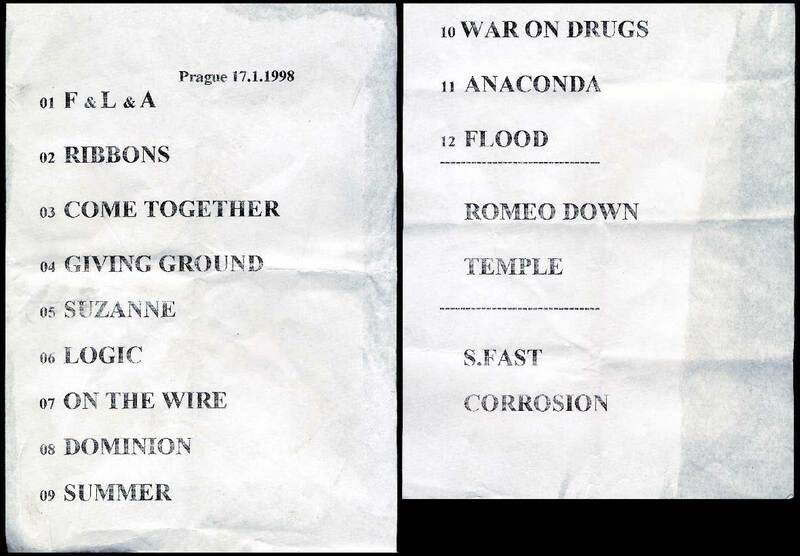 1998/01/16 Vienna has one and only this tour -- and last ever -- Under the Gun. It also opened with Kiss the Carpet and has nonstandard setlist, mostly because there was no standard setlist then. Four more early gigs have mess for setlist -- Erlangen, Chemnitz, Berlin and Prague; the later only has 16 songs, making it shortest gig in 1997-1999 period. None of the above gigs include the standard American ("3rd") set, which was played in New York, Toronto, Chicago, first San Francisco and first London shows. Los Angeles gig feature a derivative of the set (Train/Detonation Boulevard is out and Body Electric is in).